Mexican and Mexican American women have written about Texas and their lives in the state since colonial times. 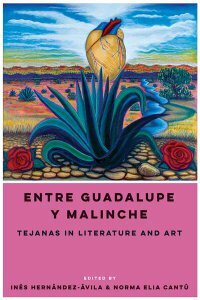 Edited by fellow Tejanas Inés Hernández-Ávila and Norma Elia Cantú, Entre Guadalupe y Malinche gathers, for the first time, a representative body of work about the lives and experiences of women who identify as Tejanas in both the literary and visual arts. The writings of more than fifty authors and the artwork of eight artists manifest the nuanced complexity of what it means to be Tejana and how this identity offers alternative perspectives to contemporary notions of Chicana identity, community, and culture. Considering Texas-Mexican women and their identity formations, subjectivities, and location on the longest border between Mexico and any of the southwestern states acknowledges the profound influence that land and history have on a people and a community, and how Tejana creative traditions have been shaped by historical, geographical, cultural, linguistic, social, and political forces. This representation of Tejana arts and letters brings together the work of rising stars along with well-known figures such as writers Gloria Anzaldúa, Emma Pérez, Alicia Gaspar de Alba, Carmen Tafolla, and Pat Mora, and artists such as Carmen Lomas Garza, Kathy Vargas, Santa Barraza, and more. The collection attests to the rooted presence of the original indigenous peoples of the land now known as Tejas, as well as a strong Chicana/Mexicana feminism that has its precursors in Tejana history itself.